Factual error: A force of Russian Tu-22 Backfire bombers attacks the aircraft carrier USS John C. Stennis (CVN-74) by sneaking in under the ship's radar. This is all well and good except that carriers usually don't use their own radar, they have Airborne Early Warning aircraft (E-2 Hawkeye's) that can see much further and not give away the carrier's position (let alone the F-14s which would be patrolling too) not to mention the fleet of destroyers other ships guarding the carrier. The whole point is, the US Navy practiced and planned for such a "carrier versus Backfire" battle for years. I guess in the interest of furthering the plot Hollywood has to ignore the immense measures the USN takes to protect those multi-billion dollar assets, not to mention the 5000+ sailors that man them. Continuity mistake: In the aircraft scenes after the blast in Baltimore, watch the clocks closely. The times go forward, backward, and everything in between. 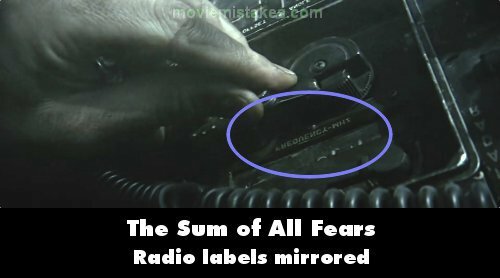 Revealing mistake: In the scene where Jack Ryan uses the radio after the helicopter crash, the film is reversed - the word frequency appears as a mirror image. Factual error: In the scene where the dock worker receives the e-mail stating 'the day has arrived', the e-mail is dated Mon, 19 Nov 2002. However, November 19 2002 was a Tuesday. Continuity mistake: When Ryan is called from bedside to his first big meeting, he is wearing a severely rumpled blue oxford. When he leaves the meeting (with the borrowed tie and jacket) his blue oxford is pressed and starched. Continuity mistake: In the scene on the NAOC (National Airborne Operations Center) E-4B where the plane begins to shake, everything on the conference table, including books, maps, charts, etc., is moving, with the exception of a clear cup of what is supposed to be soda. Not only does the cup not move, but the liquid in the cup (which is most definitely not liquid but plastic) does not move either. It's glued to the table. Factual error: The Israeli A-bomb was dropped "at the Golan", yet, the landscape where it is found looks like a sandy desert, and as time flies the bomb is completely covered with a sand dune. The Golan has everything but sands or dunes. The terrain over there is magmatic, rocky and mostly black, as the Golan was an active volcanic area. Had a bomb fallen from the sky, it would most likely remain on the ground, smashed. Continuity mistake: The nuclear blast blows in the windows at the hospital where Cathy works and all the medical staff is showered with the broken bits. At the end of the movie Cathy doesn't have a mark on her. Even if it is safety glass, the small pieces would still leave nicks, scrapes and small cuts on exposed skin. Factual error: Why is the President's motorcade so small? There were only a few cars there to protect the most powerful man on the face of the Earth. The President ALWAYS travels with over a dozen Secret Service vehicles, to protect him. Even if when he left the Superbowl was an emergency, all of the motorcade would have left with him also, ruling out the possibility that only some of the cars left with him. Plot hole: When the President of the United States attends a public gathering (such as the SuperBowl) the level of security is extremely high. So why wasn't Mason's delivery on the day of the game checked for explosive devices? Continuity mistake: Shortly before the nuclear bomb secreted in the bowels of Ravens stadium explodes, an aerial shot of Ravens stadium & the surrounding area is shown. The football game is in progress, but the aerial shot shows the stadium to be completely empty. Factual error: When the aircraft carrier is attacked by the Russian aircraft, the carrier is sailing alone. This is not normal as carriers always sail in carrier battle groups, with several smaller ships (cruisers, destroyers) to protect them. 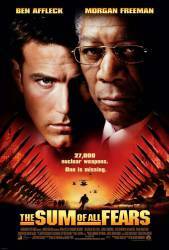 Plot hole: The bomb is found by Bedouin in the Golan (north of Israel). However, it was dropped in the Negev desert (south of Israel). How the bomb managed to move itself 500km is not clear. And Bedouin don't live in the Golan. Other mistake: At one point during the sub-titled Russian scenes, the word Annihilation is used. However, it was mis-spelled as Anihilation. Continuity mistake: In the scene where Clark and Ryan come ashore by Zodiac, they are soaked just before they beach the boat, but as they drag it up the beach their clothing (especially Ryan's woolen hat) is bone dry. Revealing mistake: In the scene where the president's motorcade is going to the stadium, it travels on overpasses, but there is other traffic passing below. These over / underpasses would have been temporarily shut down as well while the motorcade goes by. Factual error: Dressler is supposed to live in Vienna, Austria. However, in the final scene, when his car explodes, the county-code on the numberplate is not the one from Vienna, nor from any other county in Austria. What is more the letters have the wrong font and the county emblem is missing. Factual error: After the US President gives the order to launch the missiles, you see a view of a missile preparing for launch. This is followed by scenes of B-2s launching. The missile shown is an older liquid fuelled missile. The US military retired all liquid fuelled missiles from its inventory long before the first B-2 rolled off the assembly line. As such you wouldn't see both in use at the same time. Deliberate mistake: When asked about the effects of a gas attack on a village in Russia, the president is told that the effects were similar to end stage cerebral palsy. One major problem - cerebral palsy is a chronic condition, not acute. The condition itself is not fatal.